The Steadicam Merlin offers light, agile, seamless shooting for today’s videographer. Ultra-light and ultra-compact, the Steadicam Merlin allows you to keep up with the action more easily than ever. Designed by Garrett Brown, the inventor of the original Steadicam Jr, the Merlin is the next generation hand held Steadicam system. The Steadicam Merlin is half the weight and four times as stable as the JR. Yet, it can move as smoothly as the big $60,000 rigs used in Hollywood. The Merlin let’s you “fly” wherever the scene takes you–up and down steps, indoors and outside, through crowds–almost anywhere, with precise, elegant control and ease. 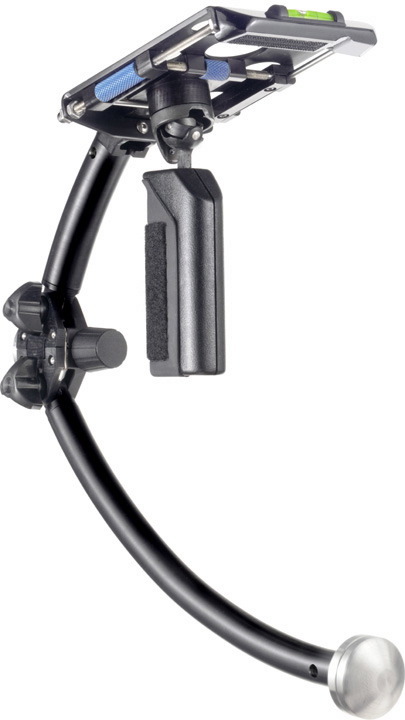 Its quick release mount lets you instantly swap camera connections between your Merlin and any tripod. Merlin’s design significantly reduces fatigue. So lightweight, it weighs less than a can of soda. With a compact DV, balanced and ready to go, the Merlin weighs about two pounds. Its rigid construction permits longer focal lengths than ever imaginable with a hand-held stabilizer. Merlin’s unique dual extended weight system greatly increases inertial stability. And its counterbalancing weight can be precisely adjusted to balance cameras from 0.5 to 5 lbs. The new patent-pending “Folding-Caliper”TM hinge allows instant fold-up, perfect for shoulder-mounted shooting, and just as quickly, returns precisely for hand-held camera work. The new Merlin Arm and Vest make extended shooting nearly effortless. Even with heavy cameras – up to seven pounds (3.2kg), the Merlin can now fly for hours without undue fatigue, and preserve all the flexibility and reach of the operator’s own arms. The 2.6lb (1.2kg) Merlin Vest is the lightest and thinnest ever made – it can even be worn under a tuxedo jacket – and it’s designed to fit the entire gamut of human sizes and shapes. For 23kg eight-year-olds or 150kg linebackers, the Merlin Vest provides complete comfort and functionality for extended productions and long continuous shots. All adjustments are ‘no-tools, including the right-arm/left-arm changeover. The Merlin Arm is ultra-light and extremely capable. It’s a 7/8 scale version of its big brothers, the Flyer, G-50 and G-70 arms, and provides the same legendary performance and flexibility including instant, knob-adjustable control of lifting power for camera payloads between 2.5 and 7 lbs. (1.1 to 3.2 kg) The Merlin Arm also provides enormous vertical lifting range (28” or 71cm) and full ‘iso-elasticity’ so you’ll need only ounces of force to maintain the highest or lowest lens heights (from way above the head to below the waist). Like its big brothers, the Merlin Arm includes two-axis adjustment of the arm-to-body angle so that people of differing shapes can adjust the lifting angle to their most comfortable posture. Together the Merlin Arm and Vest actually increase your shooting options. The operator can ease the Merlin back against the body and shoot ‘handheld’, with both hands on the camera, and fly seamlessly back off the shoulder and continue moving. With practice operators can fly the Merlin one-handed right off of the mounting post during a shot (docking the arm to the vest with the other hand) and execute those unique Merlin shot opportunities – ultra-low- or ultra-high-angles – and then slip it back onto the arm to continue the shot.